Update July 23, 2014 Wow. 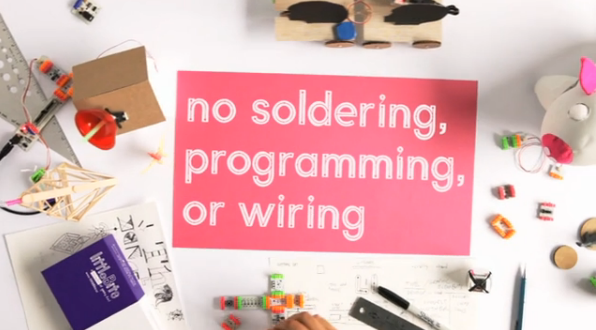 From toys to tools…LittleBits launches CloudBit to make any object ‘smart’! Sept. 4, 2012 “Light it, push it, twist it, bend it, buzz it, blink it, shake it…” the promo card beckoned before I even reached the Little Bits tent at the Maker Faire. Hard to believe it’s back to school time already, and this fall, we’re kicking off with some STEM (Science, Technology, Engineering, and Math) “makers” in the media mix that are fun for even the tiniest tots to poke and prod and get jazzed about buildables; literally ‘turning the lights on’ with their imaginative engineering play. Sure enough, some kids barely even able to reach table height were squealing with glee when they’d make the circuit light up or ‘beep’ using the electronic modules that fit together with tiny magnets. The Little Bits themselves are purposeful little bits of energy and buildables (light sensor, coin battery, input/output, motion-trigger, wire, buzzer, dimmer, etc.) that could literally build a ‘working city’ of make-believe or individual objects with limitless imagination. Joi Ito from MIT is one of the lead investors in Little Bits, (the founder also hails from MIT, and I’m a huge fan of their Media Lab as you can see by this post I wrote on the i/O brush, Using New Media to Teach Classic Art Techniques to Kids) and I see massive promise in education if they can get their price points down for bulk classroom use; it would be absolutely amazing. Ayah Bdeir was profiled on the TED “Fellows in the Field” video about her vision for collaborative, open source, independent play, hoping children build galleries of usable creations teaching each other through media and videos, posting their work to share globally. In the clip below (she ends at 2:38 the rest is Lexus sponsored engineering/pioneering) Ayah Bdeir also talks about her dad inspiring her with wooden and plastic blocks and transistors growing up in Lebanon, and about our how we’re losing the ability to play with technology as it’s started to become more finished and closed. I completely agree with this, we’re all enveloped by technology, yet have no idea ‘how it works or why,’ much like I felt taking college anatomy for the first time! What do kids learn with Roominate? Starting from a pile of pieces, it pulls in spatial perception, planning, critical thinking to hurdle over roadblocks, and far more than just how energy flows through circuits, powers and different materials. …And it was great to see them dive in without hesitation to make and take their heartfelt homes out of the work space, beaming with pride and self-satisfaction. True, there was pink. Lots of pink. And boas and ribbons and flowers and fluff…But this is purposeful pink…a far, FAR cry from a Peggy Orenstein Cinderella Ate My Daughter moment of princess primping pink, or even a vapid gender coding of interests like ‘Lego Friends’ (see my post to Lego: A Plea for Building on Possibility and Brain Plasticity. 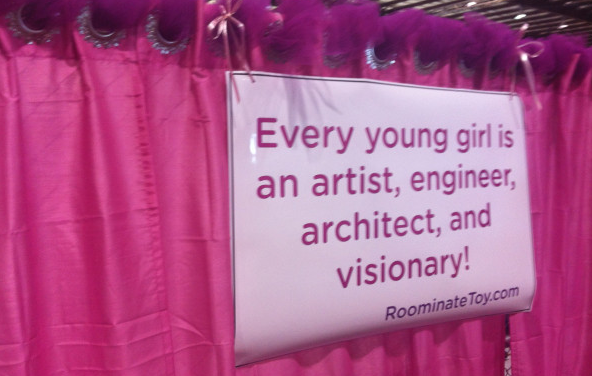 Roominate is in fact proof positive it’s not about the color, it’s about selling smarts through very strategic, targeted, deliberate “by girls, for girls” positioning of STEM as constructable fun. Roominate gives the heave-ho to Barbie’s Dreamhouse replaced with a DIY, more robust form of engaging play sans plastic peripherals and commodification, in a valiant attempt for a sea change on the STEM disconnect that’s impacting girls and minorities left behind particularly, and many of us asking what can we do to encourage girls in STEM fields more. 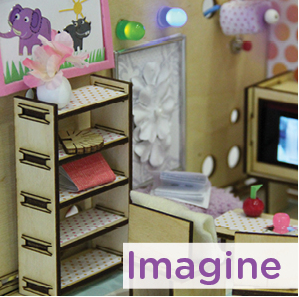 Roominate has the ability to engage all kids in its coolness by virtue of the fact that dollhouses are not ‘off limits’ to ANYone. Imagine a world where “gender apartheid” no longer existed and a toy was a toy once again. After all, the toy joy of “Maykah” is well researched and reasoned; it’s all about HOW kids play; the exclusivity of building your OWN STEM creation and making your personal mark, regardless of props, colors, fabrics and such. I know science teachers and after school shop teams could easily replicate the electricity learning, but all too often that ends up “chocolate covered broccoli” as the team wittily refers to the process of hiding education in a wrapper of fun (e.g. circuits inside of craft) The ‘toy’ factor they’ve tapped into has vast marketable potential as ‘kits’ far beyond the dire statistical need of STEM for Girls appeal. I can also see a fabulous education based ‘habitat’ mashup opportunity for these cool circuit board gizmos with elements of history/geography, (recreating cabins/missions/huts, faux-fire, jazz era, global ways of living, etc) for older kids too. 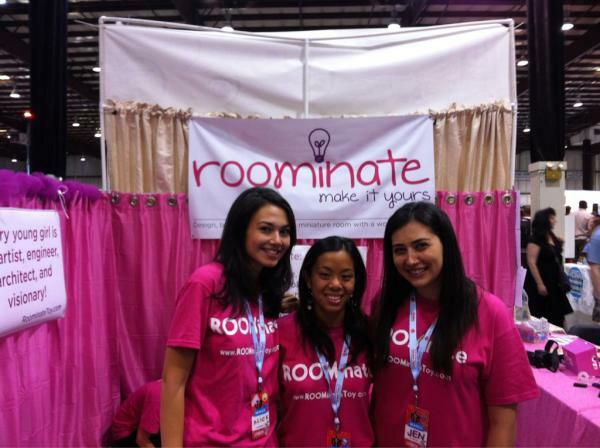 There are multiple ways Roominate could be used in classrooms blending STEM beyond fem…It’s got far more potential than a ‘pink think’ dollhouse concept to me…but I guess that’s why they have the parent company “Maykah” to build on! “It’s not that I’m anti-pink, I’m just kind of ‘post pink’ as I feel we’re being assaulted with the color in the STEM field as some sort of play permission programming.” More on that when I feature her in a separate post on more tactile STEM coolness to get kids learning hands-on. I hope they “ruminate on Roominate” for their post-kickstarter expansion. It’s got chops as a toy for girls AND boys. Outside the main Expo Hall, Maker Faire treated me to a life-size version of both of these kits in a “Make Your World” black and white walk-in structure where kids were getting hands-on know how about creating remote control objects to auto-turn on and every input and outputs imaginable in a giant sized playhouse sponsored by Intel and The Lab at Rockwell Group. They were each sent home with a free kit of simple concepts teachers could easily replicate to make learning fun: a foldable line art paper ‘stage, scene and pawn’ with 3 LEDs, a battery and copper tape. Period. Very cool. To see these concepts in real life, look no further than this Engadget feature on UC Berkeley engineering student Derek Low, a “maker” himself who automated his dorm room into a showcase of a ‘smart room’ world at his command. Pretty wild. 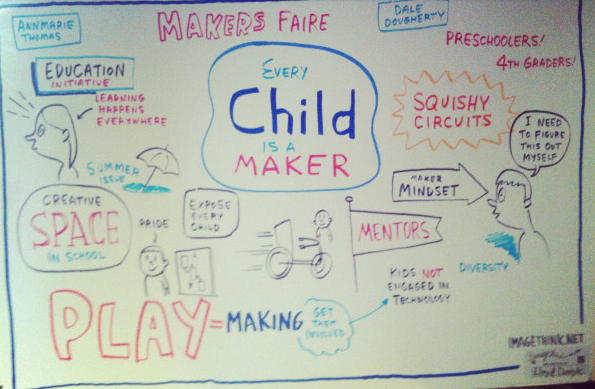 So as we fall back into school routines, let’s hope we ditch the rote screen instruction in ‘computer lab’ mode, and start thinking about STEM as a ‘toy’ for fun to ‘see where they go’ with ideation and problem-solving…School could be a living lab of 21st century makers and future builders if we could quit reining in and instead flare out with fresh ways that appeal in “look what I made” collaboration. Back to school can mean opening doors to a love of learning and exploration, or closing them tightly with a huff and a slam. 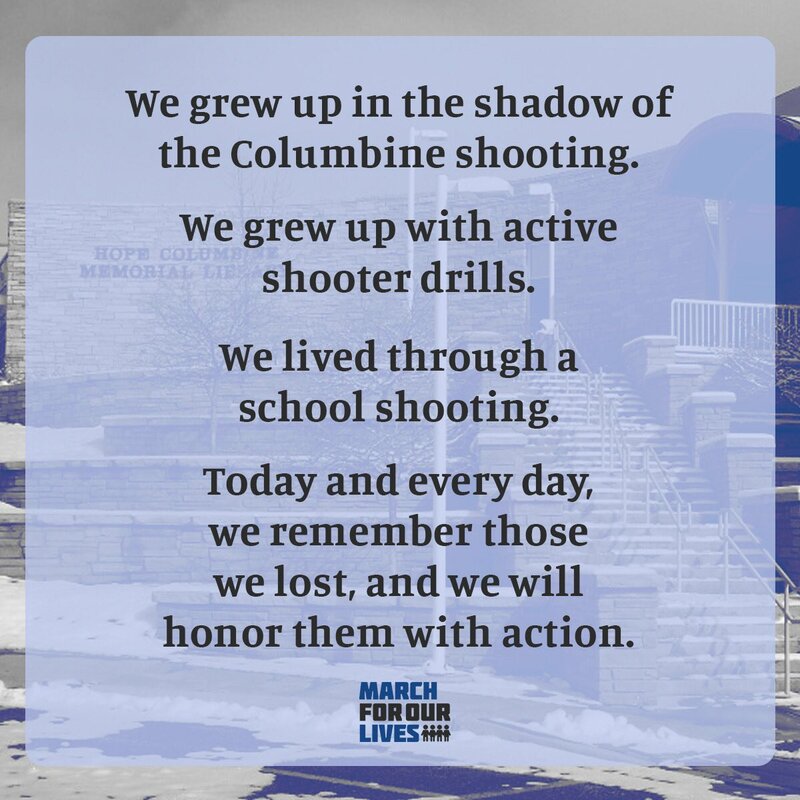 It’s up to us all. Who knows, maybe we can all learn to breathe in some fresh air from one of those mini-circuit board STEM fans. 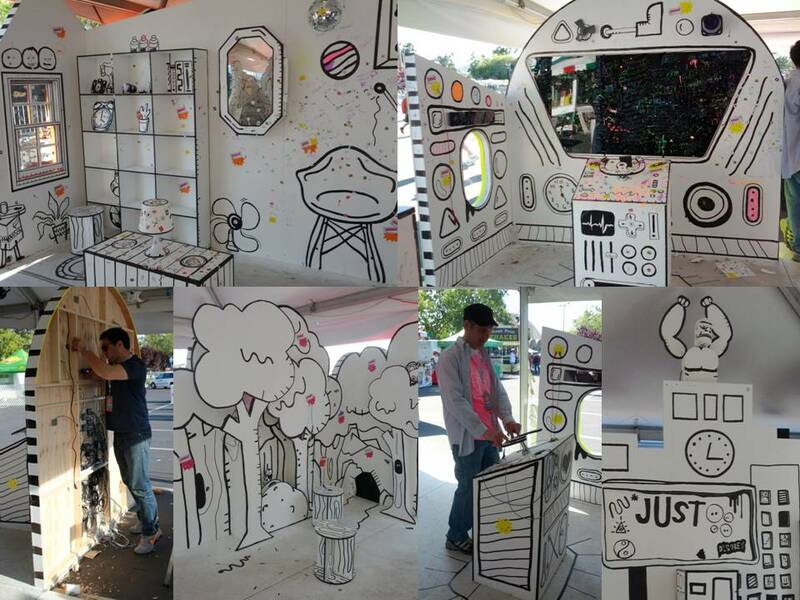 Here are a few more Maker Faire finds to bring into your world to reach and teach STEM in fun, fresh ways. 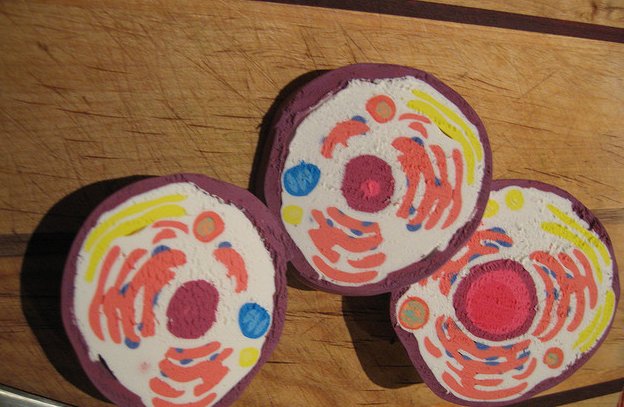 Galaxy Goo: (Back to school feature story to come) A tactile, colorful, sushi-looking cell pattern constructed from modeling clay where students build 3D models of cells from the inside out, organelle by organelle. They let the model dry, slice it open, and examine the cross sections. The site blurb says it well, “The activity is meant to encourage spatial-functional thinking and hands-on learning while using terms in discussions, instead of simply memorizing vocabulary outside of experiential context.” YES! Howtoons.com and The Scrapkins.com (Feature story to come) Using everyday household objects and recyclables, kids combine storytelling with instructions to spark a love of art, science, engineering and creativity. Scrapkins has a “Build-It Book: 12 Things You Can Make from Junk” and Howtoons is a series of comics that literally teaches how to build with STEM from PVC pipe marshmallow shooters to snowglobes. All about hands-on making versus buying; an educator’s dream. Instructables.com: This DIY ‘share what you make’ site is a treasure trove of freebie STEM fun; just check out their twitter stream to see the types of buildables and creations being posted in this global community of over 10 million monthly visitors. Misguided Media: Space station takes a backseat to Britney? How to Drive STEM Careers By Making Math Relevant and Fun! Hello Amy (or Web Admin?) I noticed that your On-Page SEO is is missing a few factors, for one you do not use all three H tags in your post, also I notice that you are not using bold or italics properly in your SEO optimization. On-Page SEO means more now than ever since the new Google update: Panda. No longer are backlinks and simply pinging or sending out a RSS feed the key to getting Google PageRank or Alexa Rankings, You now NEED On-Page SEO. So what is good On-Page SEO? Danette, Yes, we’re just now (sloooooowly) switching over to WordPress Engine…I’ll tell our tech guy Sky (Red7.com) to get on it, AND to check out this plug in, thank you.